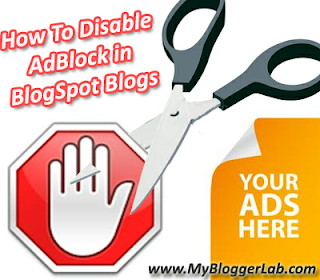 How To Block AdBlocker on Your Blogger Blogspot? Advertisement annoys each and every visitor especially the pop up ads. This is the reason why lots of internet addicts recommend AdBlock, which brings fruitful experience to users but for Bloggers it’s the biggest pain in their brain. When a user blocks ads with the help of Ad Blocking Software It takes away lots of earning opportunities from a blogger and hence, they notice a significant decrease in their earnings. You have seen lots of WordPress Plugins created to block unwanted advertisement, but blogger lacks in optimizing. Therefore, in blogger we don’t have identical scripts like WordPress but what we have is, worth considering. This script will keep on sending notifications to your visitors until they disable AdBlock so today we will discuss How to Block AdBlock on Blogger BlogSpot Blog? Ad Blocker not only hurts a blogger mentally but also damages his online earning possibilities. Earning is not everything, but to run an organization we need money so if there would be no earning then the probabilities are extremely high that a blog might face the tragic ending, and as a result users would lose their vital source of learning. Readers moreover loyal readers need to realize, that a man who is responsible for running such an enormous organization, who is keeping everything together in a systematic manner need some sort of token money. It doesn’t matter whether the money is large or small, but it does increases thirst in a blogger to blog more effectively. This is the toughest part of this whole process, with the help of some scripts we can easily detect their browsers, operating system and even their IP Addresses but its extremely difficult to identify whether they are using it or not. Here we need to compare our Blog’s daily visitors and earning statistics, if the earning ratio is extremely low in comparison with visitors then sure-enough your visitors are bluffing you with ad blocker. There are two different methods which could be utilized to realize our visitors to disable ad blocker while surfing your website. Make conversations with your reader on your blog or schedule a hangout with them, and make them realize that the community is declining due to lack of sponsors, while some sponsors are not satisfied because visitors are using ad blocking scripts. It has almost cut downed blog’s earning into two pieces. Ask for help, and tell them to disable their Ad Blocker while browsing your blog. To force your visitors to disable AdBlocker we will use a Script which will detect AdBlock and guide the user to disable if they want to continue, otherwise it will keep on sending annoying notifications to until or unless they disable AdBlock so to do so. Back up your template incase any thing went wrong. Then search for ]]></b:skin> and once you find it, just above it paste the following CSS code. Now Search for <body> and just below it paste the following code. All done Save your Template by pressing Save Now button. 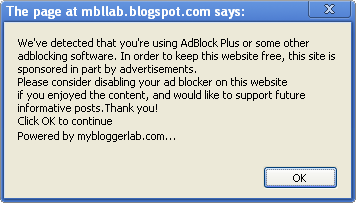 Now any visitors who will visit you blog with AdBlock enable will face an annoying message, he will continue to get this message until he disables AdBlock. Here is the example of that message. So, guys we hope now you are stress free and can easily wipe out those who are bluffing you with AdBlock. If you need any help feel free to ask till then, peace, blessing and Happy NO Ads Blocking. Nice Article Faizan,, Can You Please Tell Me How To Do So In Wordpress? code are visible visitor. How to solve this ? It should be considered that things are not so black and white when it comes to ad-blocking. Even though ad-block users are using your server and bandwidth resources, your site might still be able to extract value from them in other less obvious ways. They may share your article or content with friends, for instance, who will in turn visit your site and are perhaps not ad-blocking. The ad-block user may also contribute to the comments, which can have a benefit to the SEO authority of the page if they’re relevant as well as possibly being useful to other readers or the article author. If you think this applies to your site, not doing anything may well be the best approach to take. Other wise ask users Politely to stop .That pop up message could decrese your traffic. You have no experince in blogging.All you do that you copy posts from others and give it a new look and publish to your blog you also copied the domain...mofo from mybloggertricks Learn how to blog first.! Thanks For Supporting Us Guys Proud To Be a MBLian!! Thanks Buddy, Yeah you can easily Block AdBlocker On WordPress and you know what its has more features. Here is the Plugin Check it Out No Adblock Plugin For WordPress . Peace Dude!! Brother The Element above ]]> are knows as CSS style sheet we can hide them in a link but it will be still view-able by any User. If we make it private then our blogs Design will not look so great so All an All we cannot hide it Peace. Hey Buddy! Thanks For Giving Some Really Nice Tips to our Readers. But Sometimes a Blogger get so annoyed from AdBlockers that he need to take this tough decision to Block those users who are using AdBlocker. This realize readers that the man who is working so hard need some sort of Support. Yeah! Talking is the best way to solve the confusion and we have already included it in our Article. Your Comment was not deleted it was catch up in our Spam box automatically because first it was long, second its directing a URL. As Far as Newbie is concern I Openly says i am a NEWBIE and nothing more then a grain or said its the Almighty Allah who has given me everything. Well Dude! I think you have not checked our articles, widgets and Tricks about 90 Percent Widgets are Unique and we are the original Copyright owners. We always prefer high quality posts for our readers because they are most important for us. Well, MBT is one of the favorite blog this is the reason it is the only Blog which is linked to our each and every Page. Peace Buddy. i am very much annoyed when an ad suddenly pops up especially when i am reading on a blogpost, instead of finishing what i am reading, i just leave the site at once. your tutorial is very useful,you had my thumbs up! @syed faizan ali .Soory about that..>! Pop ups and ads can really be annoying. If there are too much of those I really avoid those sites. I think ads are ok as long they are kept to the minimum. I mean, the point of visiting a site is to get information not look at ads. We are Working to Resolve that Issue. Please We need Patience Peace. Some useful information that i and everyone can use. I came here mainly because i have a script running on my blog,it might be someone who i have added not to long ago,but i cannot pinpoint who it is as i have added a few people in the past few days. But i digress Ha Ha .These ads are popping up when I go to view my blog Stats in my Dash Board . I need a way to find the culprit,and eliminate and take or block this person from my join list, so that this annoying thing stops. Is there a way to trace this ? This pop up message continues even if the visitor disabled the AdBlock. Is there any solution for that? After Posting the Script I Save The template and when i test it. I tried this script , but the pop up always appear with or without enabling the adblock, can you please verify again? I think this is a great idea, but I think its going to scare people away from my blog site. Its all to do with peoples freedom. Also I know there's a lot of dodgy popup adverts out there. I added a different js and its working for me. Check it out, "http://get-your-ebooks.blogspot.com/". If anyone needs help, contact me. Pls, could you sent to me the code you are using? i tried this code, not working. so i used another method of notification.